Have you heard of the Wild Atlantic Way? - The Wild Atlantic Way is a 2500km touring route along the West Coast of Ireland. - It features 157 discovery points, 1000 attractions and more than 2500 activities. - Begins in Kinsale, County Cork and ends at Irelands most northernly point, Malin Head, County Donegal. 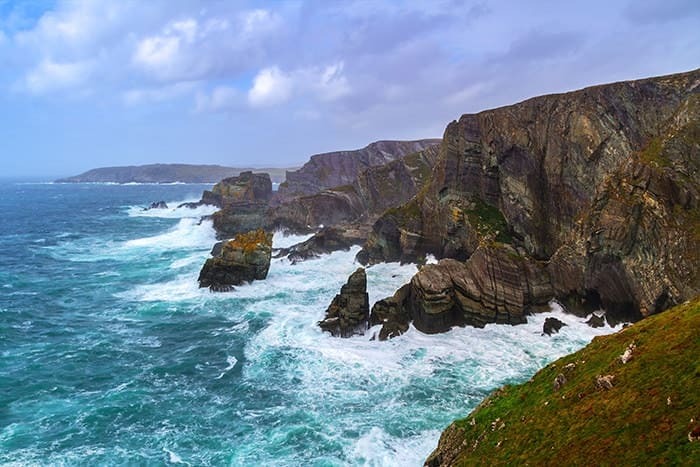 The Wild Atlantic Way is Ireland's first and only long distance driving path for tourists, which stretches along the Atlantic coast from the stunning Donegal to the spectacular West Cork, an 2,500km route. It has become the European equivalent of the Great Ocean Road: Australia, Pacific Coast highway: USA and The Garden Route: South Africa. Obviously, it doesn’t matter which way you go, but arriving in Cork airport, hiring a car and beginning from the town of Kinsale is the most popular way to make this trip. 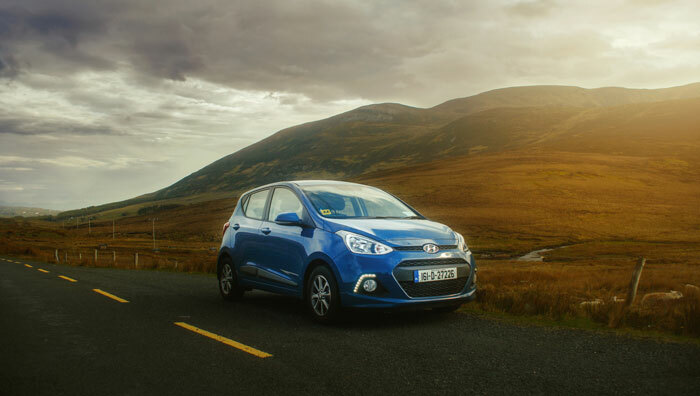 The Wild Atlantic Way is travelled by thousands of Irish Car Rentals customers every year. The Wild Atlantic Way is vast in scope, and choosing what you would most like to see, what order to visit where, or even a place to begin your adventure can seem daunting. That being the case, when we asked our customers which parts they loved in particular, we found several places being mentioned time and again. Slieve League - the highest sea cliffs in Europe. 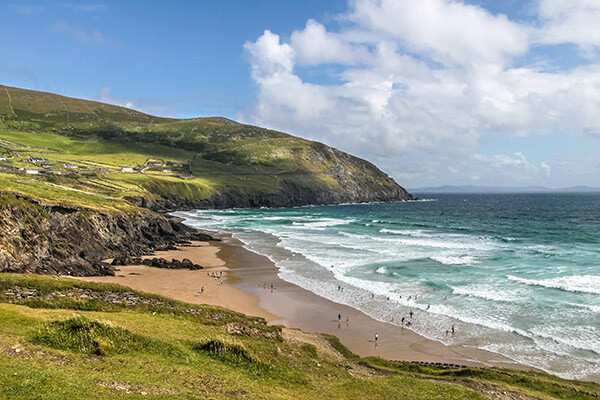 This is an 2-3 days Itinerary, exploring Dingle taking in the Slea Head drive and the not to be missed Ring of Kerry. This route is ranked as some of Ireland’s most dramatic countryside, while trips to Slea Head, Valentia Island and the Skellig Islands are well worth the effort. In Dingle, the Slea Head loop scenic drive is a 46km on cliff top roads around the coastal landscape. Slea Head drive allows you to view the remote islands and rich with heritage history – megalithic tombs, Dunbeg Fort and 6-9th Century Gallarus Oratory. Starting from Dingle, drive towards Ventry and Dunbeg Promontory Fort for a stop, continuing onto the beehive huts used by early Christian settlements. From here, drive to Dunquin where you’ll find a unique Dun Chaoin Pier and scenic view of Blasket Islands. Finishing up the day and drive to Killarney for the night. Starting in Killarney and head towards Killorglin stopping at Gap of Dunloe, a narrow mountain pass between MacGillycuddy’s Reeks and Purple Mountain – wonderful views! Continue towards Caherciveen – Valentia Island lying off the Iveragh Peninsula, stopping at Portmagee overnight. Skellig Ring where you get breath-taking clifftop views of Skellig Michael. The Skellig Ring Drive is a small section south of the Ring of Kerry drive with beautiful views. Continue on to Ballinskelligsbeach, Sneem, Kenmare to view Molls Gap, Torc Waterfall and Ladies view panoramic viewpoint. Completing the trip at the Muckross House and Lakes in Killarney. For more itineraries along the Atlantic route, read the full road trip in Ireland guide. 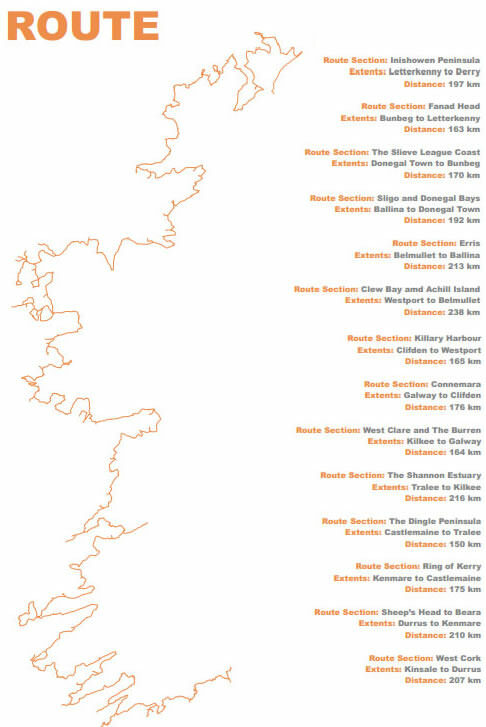 The map below show's the full route of the Wild Atlantic Way route, the length of Ireland! 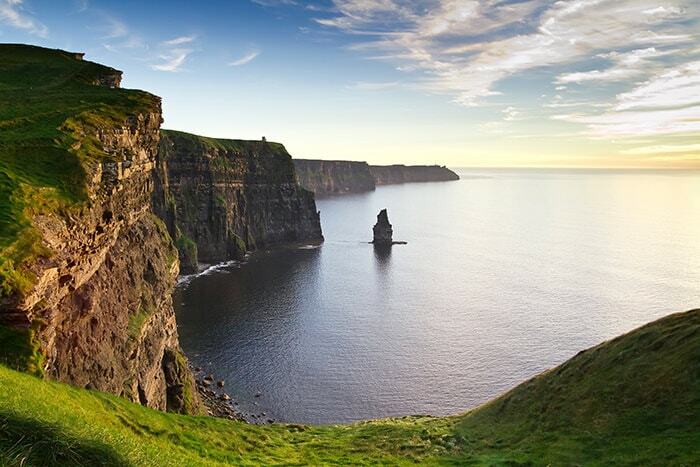 The Cliffs of Moher drop suddenly and dramatically into the Atlantic from a height of around 200 metres and, in the 1987 fantasy movie The Princess Bride, they became the infamous “Cliffs of Insanity”. 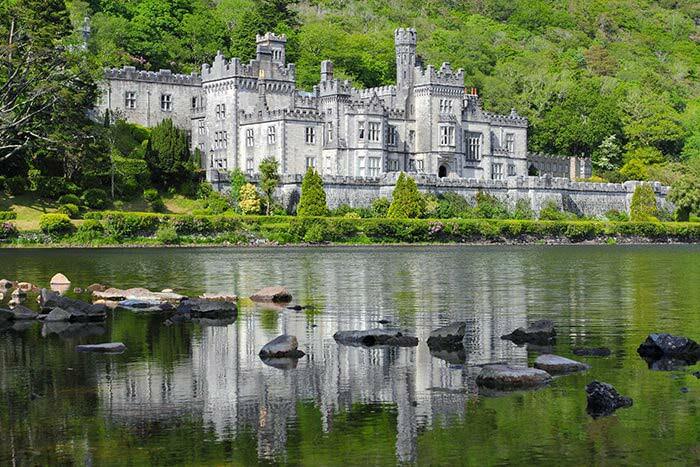 Kylemore Abbey and Victorian Walled Garden is located about an hour’s drive from Galway City. The famous image of a gothic castle reflected in a Connemara lake has made Kylemore Abbey popular. The main aim of Wild Atlantic Way scheme is to produce a long distance driving course that will enable greater recognition for the west coast of Ireland to international tourists, while luring them to the main attractions and minor destinations the entire way along the west coast. The project exposes a large number of towns and attractions to visitors and display the unique culture and magnificent scenery of the western coast. There are many car rental companies that offers car & van service in Republic of Ireland. Irish Car Rentals has 16+ locations, collect a car from any of these locations; Cork, Kerry Airport, Shannon Airport, Galway or Sligo and start your epic journey!